1. What are your influences and sources of inspiration? That’s a touch question to start with! A major influence in my writing definitely comes from my gaming background, as it determines how I initially start to think about the stories I want to write. The influences on what I want to write about are a bit easier, since that comes down to what I like to read and watch (I firmly believe that you should write what you would want to read – trying to write in a genre or particular style just because it’s popular at the time will never produce a good work, IMHO). But inspiration is a hard one to nail down, since it can come from many different sources. I’ve had inspiration strike me from watching TV, listening to a podcast, and even while looking out the window on a beautiful summers day. I find inspiration is all around me, and I can’t really point to any single source. 2. What genres do you read and why? I tend to read science fiction (I was a big Asimov fan growing up), modern-day supernatural (monsters living in our world – usually evil monsters that have to be hunted down and killed), and occasionally fantasy (most types really, from the high magic epics, to the low magic dark and gritty settings). I also read a bit of horror, although it’s not really a genre I go out of my way to find. And then there are random things that I read because they sound interesting, or I see a recommendation for them on a forum post or web site. Red Adept has a lot to answer for in this way, as I’ve bought a few books I wouldn’t normally have because she gave them good reviews! I don’t know that I have a simple answer to the “why” aspect of the question. I guess I like to read about interesting characters going on big (or even small) adventures, and those are the genres that often supply that. 3. Who are your favourite authors and why? Terry Pratchett is one – I love the humor of Discworld, and the often downright silliness of the situations that the main characters find themselves in. My favorite books are the ones dealing with the Watch, but I’ve liked pretty much all of them. I love Jim Butcher and his Dresden Files books, mainly for the setting. As I mentioned above, I’m a sucker for modern-day supernatural settings of all sorts 🙂 Plus the main character of the series, Harry Dresden, seems to have a knack for finding himself in a hole and deciding the best way to get out is to keep digging. Neil Gaiman is another author I enjoy reading. I absolutely loved his Sandman series – the development of that story amazing, and I was even more impressed when I realised as I got to the end that some of the events that finished off the series had had their seeds planted in some of the first books published years before. That was impressive forward thinking! Finally I have to give a shout-out again to Isaac Asimov, who I grew up reading. His books were what gave me my love of the science fiction genre. 4. Have you met any famous writers and did they live up to your expectations? I’ve only met one – Neil Gaiman. He was fantastic. Despite being severely jet-lagged he managed to do a talk, and then be polite and keep smiling while signing everyone’s books for several hours. I doubt I could have done it, and I think it says a huge amount about how much he appreciates meeting his fans. 5. Aside from writing, what other interests do you have? Otherwise, these days my other interests would be reading and playing computer games. 6. Have you had anything traditionally published or adapted into a film? Not even close 🙂 I wouldn’t object to being traditionally published in the future, if the right deal was offered. But I wouldn’t roll over and sign anything that was waved toward me just so I could say I had a publisher. I think in the future publishers will have to be willing to negotiate their deals with authors, knowing that authors now have the option of going it alone (which they didn’t really have before ebooks came along). Whether the publishers will react by trying to offer more benefits to keep authors happy, or go the opposite route by trying to tie down authors so they are unable to check out other options, remains to be seen. 7. Can any of your work be viewed, if so where? Not at the time that I’m writing this, as I’ve only just published my first book. But from this week forward I plan to offer samples of my work as it is released on my website – http://www.jasonga.com. 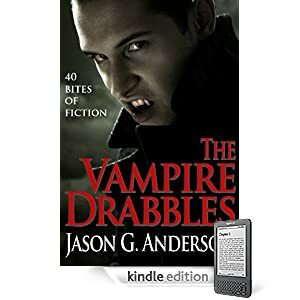 I’ll be posting exerpts from short stories and novels, and in the case of drabble (100-word story) collections I’ll be posting a number of drabbles from the books. 8. What’s your current book about? is a collection of forty drabbles, all on the topic of vampires. And they’re not just the regular Western vampire (long teeth, sucking blood) that we see on TV and in the movies. I looked at various vampire myths from around the world when writing many of the stories. I first learned about drabbles from an author named Michael Crane, in his book “Lessons and Other Morbid Drabbles”. The idea that you could write a story in 100 words intrigued me. After reading his collection I decided to try writing some drabbles of my own, and I found that they were a lot of fun to do! I plan to release a few more drabble collections over the coming months (I write one a day as a warm-up exercise), along with a few other things that are in the works.